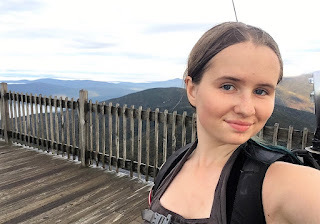 Last Monday, I solo hiked Cannon Mountain. I started the hike at around 5:00 am since I had an AP English Language class in the morning that I needed to attend that day. Soon after I began the hike, I delayered and took off my fleece. The sky was a dark and mysterious blue-gray. The sky lightened as the sun came up. I had multiple viewpoints while hiking, thanks to the many gaps in the trees. The gradual sunrise was beautiful. I like this picture; I was luckily able to capture perfect purple clouds with pink bases. I was happy to see the summit structure. It was a beautiful morning. After a little while, Sage and Mom, who were hiking the mountain as well (but significantly behind me so I could hike solo), caught up with me, and we spent some time at the summit together. The leaves are turning already! Time flies.